In the months before the first preorders were taken, there was much discussion and community voting about the best layout. This was one of the final votes. The final layout was different from either one of the two most popular community proposals, but incorporated some of the suggestions such as having a "Pandora" button. Many desirable applications require a keyboard,general consensus was that an on-screen keyboard wasn't good enough. For computing mode, the game controls are used for mouse, cursor and control keys. Some classic systems such as the Atari and C64, which had keyboards, are far more comfortably emulated on a device with a keyboard. 6.2 How many keypresses can it detect at once? First, an apology - I'm writing this without knowing how to remap the keys on the keyboard, so this is not really a tutorial. It is currently just a collection point for information on the subject. There is a Pandora event map daemon, which reacts to the lid close, Pandora button and power button. Find the keycodes which you want to modify. Run xev (this needs to be installed from angstrom repo) from the terminal, and record the numbers. If you want to use the 'a' and 'b' buttons, the codes are 110 and 115 respectively. As a test, open the XFCE Accessibility settings and enable mouse keys. The keyboard layout changer provides a means to easily change keyboard layout. Possible uses are for typing in a different language on your Pandora, for using an external keyboard, or simply for making small key modifications. You will now see a choice of keyboard layouts. Choose one, and your layout will change! Keyboard layout is an app by slashjag which helps you change layout in a graphical interface. What this means is that it's using the "us" layout with the modifications specified in the ".pndXmodmap" file (the Pandora needs these modifications because its keyboard isn't the same as a standard one). So there are two basic things you could change: you could replace "us" with a different base layout, or you could replace "~/.pndXmodmap" with a different file. Save the file. Then just start Keyboard Layout Changer, and you'll be able to select it. Ok, now let's break this down a little. keycode 38 = a A a A - the first two letters after the = sign are what you'll get if you press the button marked A with and without holding "shift". The next two are with and without shift modifier together with a second modifier, but since there's no second modifier on the Pandora, this is redundant really. What about Fn, you may ask, isn't that a second modifier? The Fn-key acts on a lower level, and is not seen as a separate key. Instead, there are separate keycode entries for all Fn keys (the ones marked in blue on your Pandora). "NoSymbol" means that the combination doesn't produce a character. You can find a full list of symbols (or "keysyms") that you can use over here. You can edit the .pndXmodmap file itself if you want to. That'll change the default keyboard layout you have at startup. But you can also make secondary custom keyboard layouts. Once that's done, you can open the Keyboard Layout Changer, choose "RU-translit", and your keyboard layout will change to a layout similar to this one, with extra letters replacing F1-F7 (note: for those 7 letters, you can only use the Shift on the Pandora's front face, not the left shoulder button). To change back, open Keyboard Layout Changer again and select "default". In the same way, you can create any other sorts of custom layouts. The easiest way to create a new modmap file is to copy+paste the contents of /home/username/.pndXmodmap into a new file in the /media/yourSDcard/pandora/appdata/kblayout/keymaps directory and make adjustments to whatever you want to change. How many keypresses can it detect at once? It can detect two "regular" keys being pressed at once. 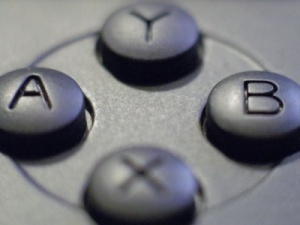 However, this restriction does not apply to the game controls, or the central "Menu" keys. 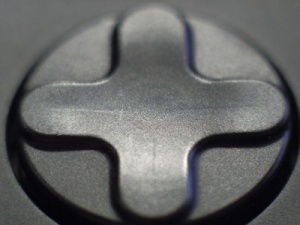 8way D-pad designed by DaveC. 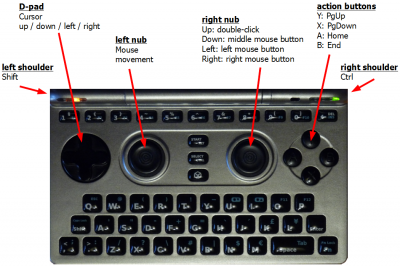 For desktop use, game controls are mapped to useful functions, replacing dedicated cursor keys and extra buttons on larger keyboards. This page was last edited on 4 April 2016, at 00:39.